We are the topmost company dealing in the manufacturing, supplying and exporting of Tile Adhesives. These adhesives possess fabulous adhesion property and are applied on the internal and external walls in order to fix them. Applauded for their reliability and waterproofing features, these tile adhesives could easily withstand unfavorable factors. Our company is involved in the manufacture, supply and export of Tile Adhesives. 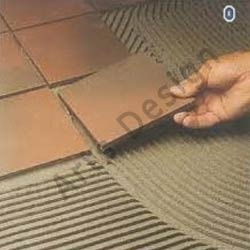 These are used for tiling and flouring. These are highly used among our customers and are manufactured by high quality raw material which is procured by our latest and trustworthy vendors. These are greatly popular for their strength and are obtainable in different colors. In addition to this these are long lasting and are waterproof in nature. These tiles are available at reasonable prices. Looking for Tile Adhesives ?